This 38-year-old woman from Chesapeake came to our practice for a consultation because she felt like she needed a “Mommy Makeover” following childbirth and a 50 pound weight loss. After a thorough discussion about her goals, we decided that her best result would be breast implants with a full breast lift as well as, an extended abdominoplasty. The goal in cosmetic plastic surgery should always be a nice, natural result while keeping the patient as safe as possible. Very few surgeons could accomplish these results and avoid unnecessary risks in a single day of surgery. With her safety as our number one priority, her two operative procedures were done four days apart so that her overall recovery time would be almost the same. 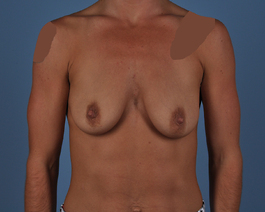 During the first procedure, implants were placed to give her fullness above and I used the vertical European lift to accomplish narrowing of the breast along with projection. This advanced technique also has the benefit of less scarring than the routine American skin lift with long scars. Four days later, she had an extended abdominoplasty to address the loose skin around her mid-section. Her photos were taken 6 months after surgery and she is already ecstatic with her new shape. 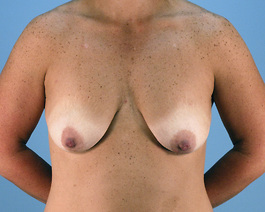 Her abdominoplasty results can be viewed in the Tummy Tuck web photo gallery Case Number 409. She is ecstatic with her new shape.